My favorite working girl photo. Monday is Halloween (as if you didn't know) and I plan to go to work as a woman for the fifth consecutive Halloween (seven Halloweens overall). Like last year, I will attempt a "live blog." I will compose and post blog entries and photos throughout the day so that you will know how my day at work as a woman progresses. The gang at work now expects Stana to show up on October 31 and I will not let them down (as if someone had to twist my arm). My feminine appearance does not garner the attention that it did in earlier appearances, but it is the one day at work that I can be me and I will not miss the opportunity. 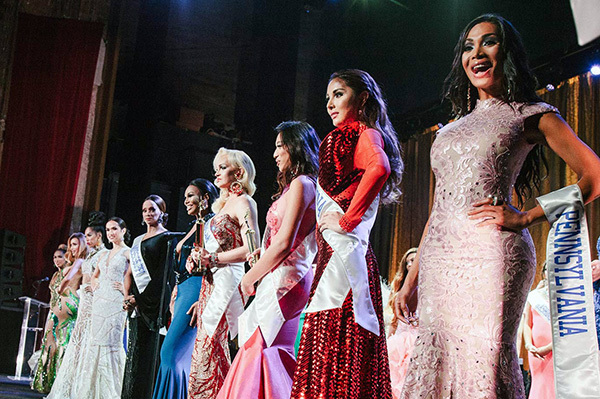 The ten finalists in the 2016 Queen USA transgender beauty pageant. Maybe one day soon every day will be Halloween? Stana, I think you ought to do a "Stana" day at work once a week instead of once a year. Sounds like your co-workers are ready for it. I'm certainly ready for it, Sally!!! The workplace will meet Heather for the first time. My plan was to not tell anyone in the office then my desk-mate proposed wearing similar or contrasting attire. I told her that it was funny that often people respond to me "yes, ma'am" and that it would be clever for me to be the ma'am for once. She said that she'd live to wear a suit and tie to counter me and so it shall be. Ironically, the next person to come to our window addressed me as ma'am. We both giggled! Please let us know how your Halloween turns out! Good Luck, Heather! Enjoy one for the rest of us that can't do this. Have you given any thought to increasing Stana'a presence at the office - to more than once a year?